Although gas prices have begun inching higher, the 38.9 million Americans who are projected to hit the highways this week for Thanksgiving travel likely will have a cheaper holiday drive than the past few years. The average price of regular gasoline was $3.2517 a gallon as of Nov. 22, according to the latest survey by market-research firm Lundberg Survey. While that’s up 3.46 cents over the previous two weeks, a year ago this time a gallon of regular cost on average about $3.47. The Lundberg data, which come from a survey of about 2,500 filling stations across the lower 48 states, track closely with the Energy Information Administration’s weekly pump-price survey. 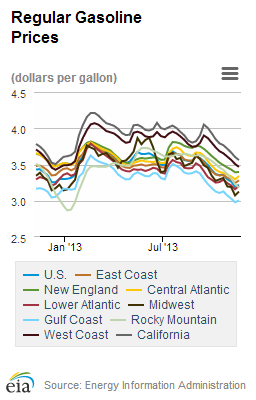 Both surveys found that gas prices have declined steadily since Labor Day. Pump prices are the result of several interacting, and not always predictable, factors, among them crude-oil prices, seasonal reformulations, refinery capacity in different regions and driver demand. This Thanksgiving’s gas prices are the lowest since 2010, when the national average price for a gallon of regular was $2.876, according to the EIA. Do lower gasoline prices make for confident consumers?